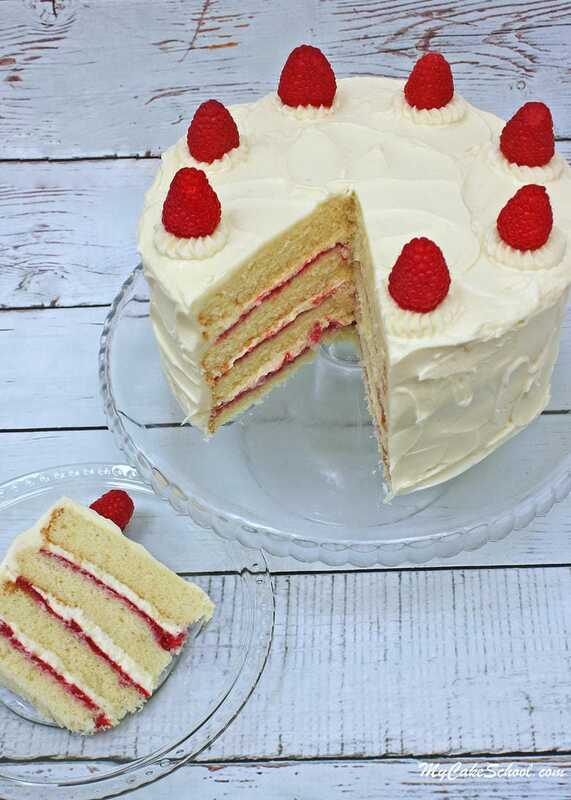 We just LOVE this new White Chocolate Raspberry Cake recipe! Light and flavorful cakes with fruit are always a popular choice no matter what the occasion. White Chocolate and raspberries are a match made in heaven. Until now, we haven’t had a cake on our site to really showcase this winning combination. 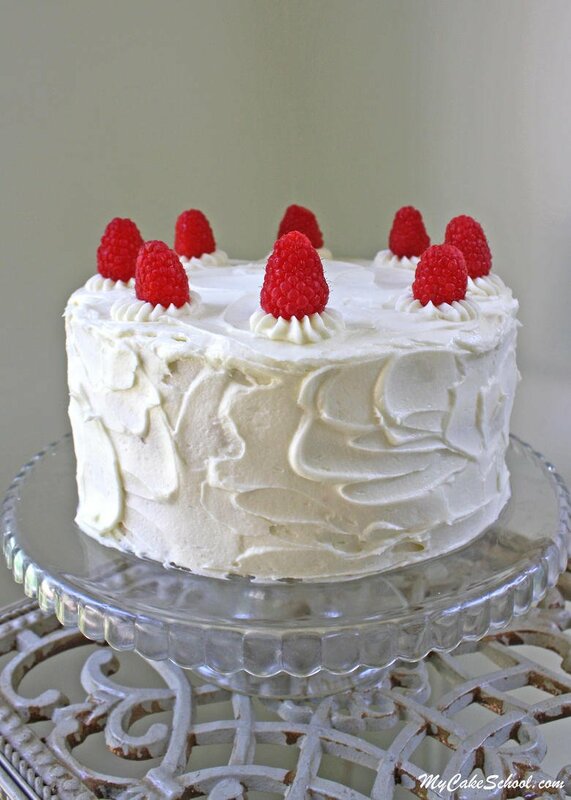 We think that you’ll find this homemade white chocolate raspberry cake to be as flavorful as it is elegant. The inclusion of white chocolate in the cake batter lends a subtle white chocolate flavor to the baked layers while also giving the cake a wonderful velvety texture. The cake is very moist but is firm enough to hold the weight of fondant. 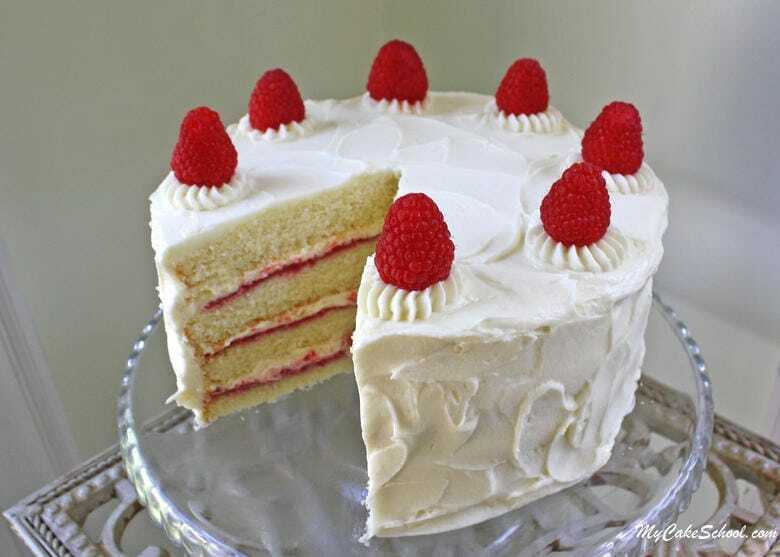 Not only are the white chocolate cake layers and raspberry filling important to this dessert, but the White Chocolate Buttercream adds a delightful boost of white chocolate flavor to the cake, making it a necessary (not to mention delicious) component of this recipe. Let’s meet two of our key players: Here’s a closeup of the Raspberry Filling… ahhhh.. Keep this recipe in mind for your cake and cupcake recipes! 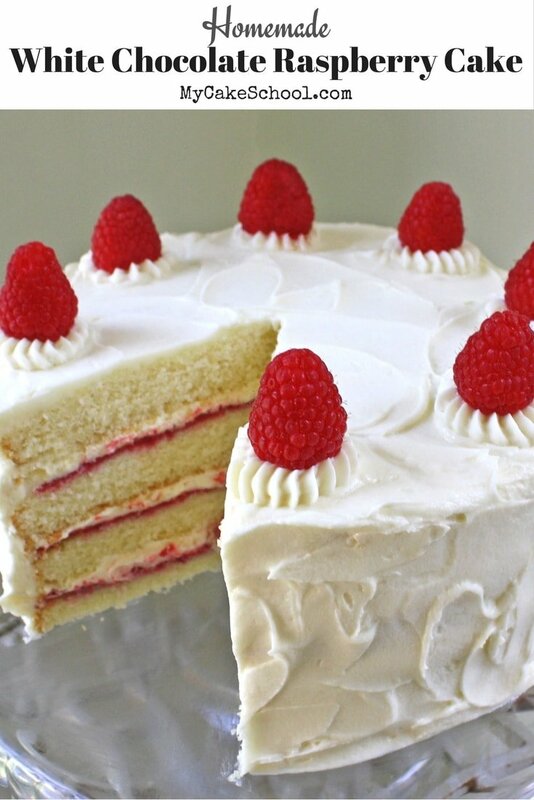 Raspberry tastes amazing with so many cakes, including chocolate, white, and lemon. And then the White Chocolate Buttercream Frosting…. I love the consistency of this frosting, and the white chocolate flavor is PERFECT! To assemble the cake, we first split the two thick white chocolate cake layers so that we would have four layers and therefore more layers of filling in each slice! Next, we spread our white chocolate cake layers with a thin layer of the homemade raspberry filling, followed by a layer of white chocolate buttercream frosting. As you can see in the photo, I didn’t pipe a buttercream ring/dam around the edge of the cake although you could. Instead, I spread on my filling without bringing it all the way to the edge of the cake layer. Leaving that bit of space around the edge ensures that you won’t have issues with the raspberry filling spilling out once the layers are stacked. I also applied several stars with a french piping tip (Ateco 863), and garnished with fresh raspberries. The finished cake stands just under 4 inches. That’s all there is to it! We hope that you enjoy this recipe as much as we have! It would be perfect for any number of special occasions including bridal and baby showers, birthdays, and weddings! Heat the milk in the microwave or on the stove top, do not let it boil. Add the white chocolate that has been cut into very small pieces. Let it sit for a couple of minutes to soften, then stir until melted and smooth. Let this cool down before using. Combine the flour, baking powder and salt, whisk for 30 seconds to blend and set aside. 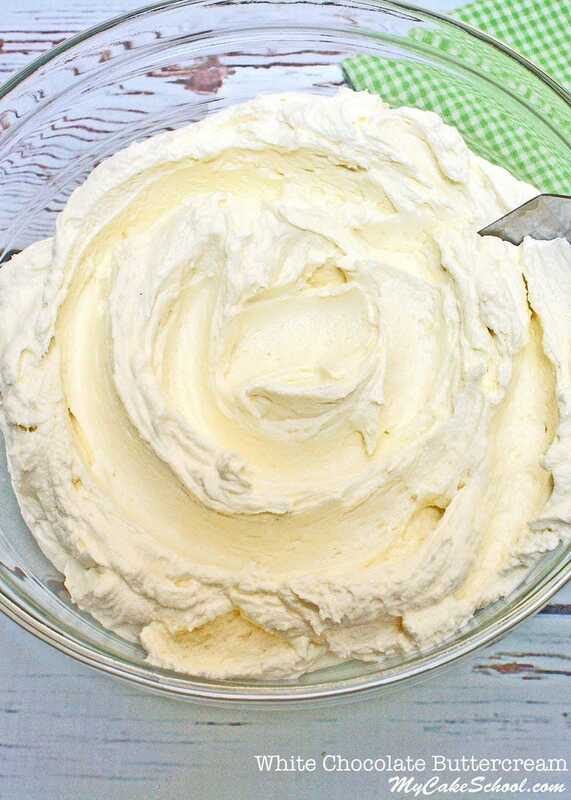 In the bowl of your mixer, beat the butter until smooth. Slowly add the sugar and beat on medium speed 4 to 5 minutes. Add the eggs one at a time, mixing after each until the yellow is blended in. Alternately add the flour mixture and the milk/chocolate mixture, beginning and ending with the flour (3 additions of flour and 2 of milk mixture). Mix until just combined, do not over mix and do not mix above medium speed. Pour batter into prepared pans and bake at 350 degrees for 30 to 35 minutes. When a toothpick inserted in the center comes out clean or with just a few crumbs attached, it is done. Let cool 10 minutes in the pans and turn out. Completely thaw the frozen raspberries. If in a hurry, and your raspberries are in a plastic bag you can thaw them more quickly by placing the bag in a bowl of hot water. Place a fine wire strainer over a bowl. Pour the thawed raspberries into the strainer and let the juice drain into the bowl. Using the back of a spoon, press the raspberries into the strainer to force the raspberry pulp into the bowl. It will take several minutes of pressing the raspberries. When finished be sure to scrape off raspberry pulp that will be clinging to the bottom of the strainer into the bowl. Discard the remaining seeds and pulp that would not go through the strainer. You should get from 1/2 to 3/4 cup of juice and pulp. Add enough water to this to make 1 1/4 cups. 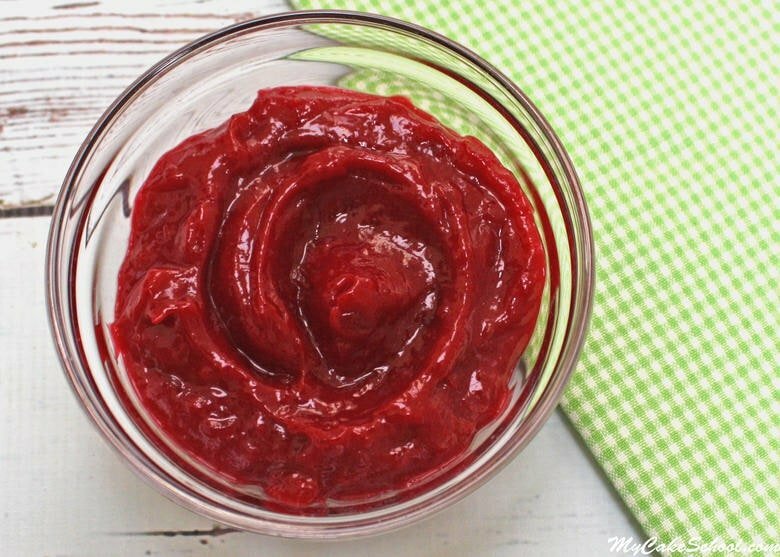 In a small saucepan, combine the raspberry juice, sugar, lemon juice and cornstarch. Whisk to blend. Cook over medium heat whisking constantly until the mixture thickens. Remove from the heat and add the raspberry extract. Stir well and allow to cool. Can be refrigerated in a covered container for a week. If you do not have cake flour, you can use all purpose flour and the following substitution: for each cup of flour in the recipe, remove 2 Tablespoons and replace with 2 Tablespoons cornstarch. For this recipe measure out 2 1/2 cups all purpose flour, remove 5 Tablespoons and replace with 5 Tablespoons cornstarch. Whisk to blend. Next, spread over the raspberry filling with a layer of White Chocolate Buttercream frosting. Frost the cake as usual. Enjoy! Thanks for stopping by! Don’t miss our full collection of FAVORITE tried and true cake and frosting recipes in our Recipes Section! We also have a growing collection of free cake tutorials in our Free Tutorial Section. Finally, if you are interested in learning even more about cake decorating, we would love for you to join us as a member! Members of MyCakeSchool.com have full online access to our entire library of cake decorating video tutorials for as long as they are a member. Hi Lauren, I am sorry you had a problem. If the frosting is too soft, you will need to add more powdered sugar until it reaches the consistency for frosting the cake. I am looking to make a small layered smash cake for my almost 1 year old niece and then 24 cupcakes of the white chocolate raspberry…any suggestions as far as pan size, cook time, if the batter will work as a cupcake??? It’s unicorn-themed. Thanks so much and so excited! Hi Katrina, This recipe works well for cupcakes. We think a 4 inch round is a nice size for a smash cake, even a 3 inch would be fine especially if it is 2 layers. This recipe makes only 6 cups of batter so depending on how full you fill the cupcake liners, you may not be able to get 24 cupcakes plus the smash cake. We usually use approx. 1/4 cup batter for a standard cupcake. For the smash cake bake at 350 degrees for 18 to 20 minutes, same as for cupcakes. Hope all goes well. Hi Bleu, That is wonderful, I’m happy you like the cake! Thanks for posting your review! Will this buttercream have a good crust to it? Hi Jen, I think it will have a light crust due to all the butter and white chocolate and only 4 1/2 cups powdered sugar. The more powdered sugar you have the harder the frosting will crust. Hi Sandrea, Yes, it should freeze with no problem. Chill the cake until the frosting firms up then wrap in plastic wrap then aluminum foil. Or you could wrap in plastic wrap, place in a bakery box then wrap the bakery box in aluminum foil. It is most important to keep it air tight. To thaw, you will need to take off the plastic wrap before the cake thaws so you will not damage the look of your frosting. Continue to thaw in the refrigerator. Hi, I wanted to make this cake in a 15 by 21 inch sheet pan. How many times would I multiply this recipe to do that? Hi Suzanne, I think you would need 18 cups of batter for a 15×21 inch sheet pan. This recipes makes only 6 cups so you would need to triple the recipe. I have never tripled this recipe but you should be able to do so. You would need a very large bowl for mixing this much batter. Bebe, thank you very much. 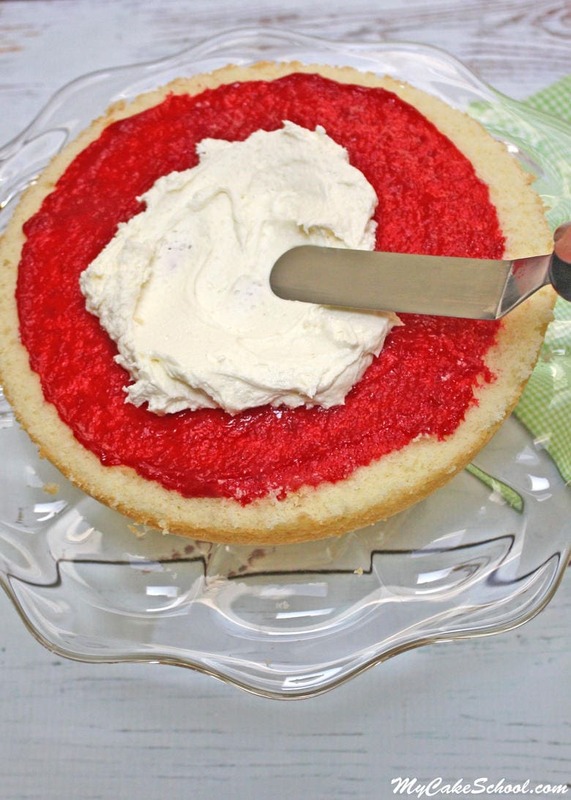 Just curious … wouldn’t it be easier to put a layer of the buttercream on before the raspberry filling instead of in reverse? Just think it would be so hard to spread frosting on top of the filling. Any reason for this order? I think Sharon has a point. It is easier to spread the buttercream first and then add the raspberry filling on top of the buttercream. Hi. Could I use this recipe Instead of the almond sour cream cake for making a rainbow layered cake? Hi Helen, I think it should work, but I just don’t know for sure if there would be any color issues since there is white chocolate in the batter. You can individually freeze the cake layers, wrap in plastic wrap and then aluminum foil. You can keep frozen 2 months. When ready to use, place wrapped on the counter top, when condensation forms on the aluminum foil, unwrap and all to thaw. If you like, you can fill and frost while partially frozen. If you plan to smooth your frosting using the Viva towel method, the layers will need to be completely thawed. Hope all goes well.